If you have followed our series of card extras for Favor The Bold, you'll know that fellow writer Kevin Jaeger is not exactly Q's biggest fan. Myself, I've never had much trouble with Q. I think we get on with each other quite well. In fact, on occasion, my friend from the Continuum is so kind as to lend me a helping hand. For example, when I've spent my entire turn recruiting personnel to complete my missions, but don't have the resources to get out those Machinations, it's nice to have Q around delivering some of those crucial events straight to the core. Just make sure that the delivery boy is standing by and ready when you need him - you don't want him to hang around at the bottom of your deck when your expensive events need to be played. Jim Kirk and K'Tal are great for this, but attempting Collapse Anti-Time Anomaly does the job, too. Also, don't forget to talk to Nog and Dax about a way to take maximum advantage of Q's discount delivery scheme! 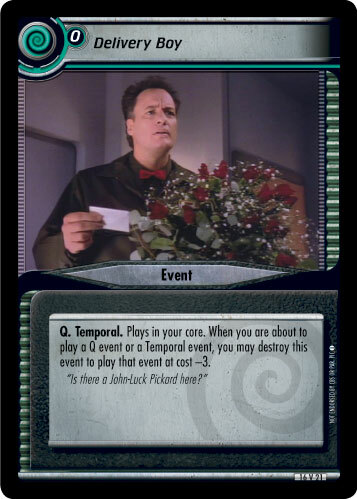 As Q deliveries specialize in the niche market of Temporal and Q events, their range of products is small but excellent: from Bigger Tattoos to Temporal Incursions to Destinies Reset, Q can offer you anything you could ask for to be a pain to your opponent's mission attempts, at the best price available. So, don't be afraid to hire the services of a godlike being. I'm sure that once you have let Q run a few errands for you, and bring you some gifts, you wouldn't want to miss your Delivery Boy.